The Seekers had been formed in Australia as an all-male group almost two years before they became famous in the UK. The later installation of Judith Durham as the lead singer was important because they then drew the attention of Tom Springfield who saw similarity between them and the, now demised, Springfields. With Springfield as manager they gained a chance to back Dusty Springfield at the London Palladium, and also obtained the 'springfieldesque' song 'I'll never find another you' from Tom Springfield. The group's Folk-Pop sound worked well in the UK despite extensive competition from the beat groups who were at the height of their popularity during the mid-1960s. In 1967 Judith Durham started her own solo career but she still sang with the group. Despite Judith's splendid voice, the material was generally poor and her own singles did not do well; she only obtained one minor hit, 'The Olive Tree'. The group were also finding it difficult to get good songs; they were even driven to remaking the old Springfield's hit 'Island Of Dreams'. The group's last chart entry came at the end of 1967 and they eventually split up during 1968. 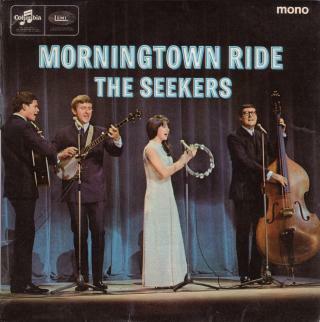 "Morningtown Ride" was the Seeker's sixth hit and also the name of the EP shown here, SEG822 from 1967. In fact, three of the numbers on this disc were from two of their 1966 singles (Morningtown Ride/Walk With Me/We're Moving On). However the fourth track, Red Rubber Ball became issued as the B-side of Island Of Dreams in 1968. Perhaps this illustrates how they began struggling to find good material. Judith Durham soon returned to Australia and gave up singing. Despite repeated attempts to lure her away from her new life she resisted pleas from other members of the Seekers and her fans to reform the group for very many years. However she eventually did so during the 1990s. Keith Portger formed the 'New Seekers' shortly after the group's original break up, but turned from singing to management before the new group achieved chart success with 'I'd Like To Teach The World to Sing' in 1971.